Rare Opportunity! One of a kind! 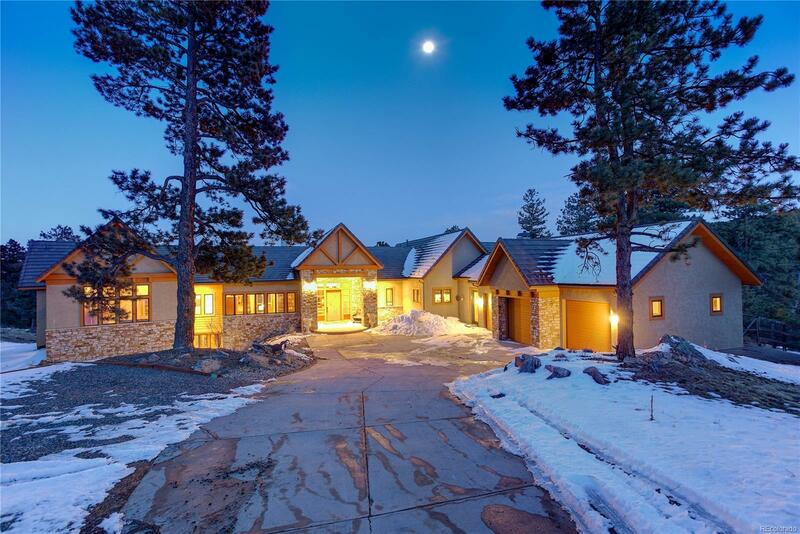 Ultimate Rocky Mountain Living! Very Private Peaceful! Secluded! Acreage! Open Floor Plan! Custom Features Throughout! Spectacular Views Day and Night! Private gated entrance! Convenient access to I-70, Evergreen, and Downtown Denver, Biking and Hiking Trails. OH! Yes! The Custom Home is Spectacular! A Must See! A Custom Walk out Ranch Model. Over 9000 sq ft of living space on 9 plus acres of wooded land. Two Master suites on main level! 5 Bedrooms, 8 Bathrooms, master with steam shower, Gourmet Kitchen with all custom upgraded appliances. Four gas fire places inside the home, wood burning fire place on deck with gas grill. Oversized 3 car garage with built in cabinets and dog run. Three private balconies with views. Just a great home for relaxing and entertaining.